We journeyed back in time again to the formation of Tent Rocks National Monument. Seven million years ago, a time of very active volcanism, about 20 small volcanoes erupted repeatedly to form sedimentary rock layers. These were then subject to erosion by wind and water to create the hoodoos that are Tent Rocks today. The students learned about this prior to our outing and were excited to see the cap rocks which helped to protect the “tents” and create these unique formations. The children stopped to notice and identify birds along our hike, and found many apache tears, also the product of volcanic activity. 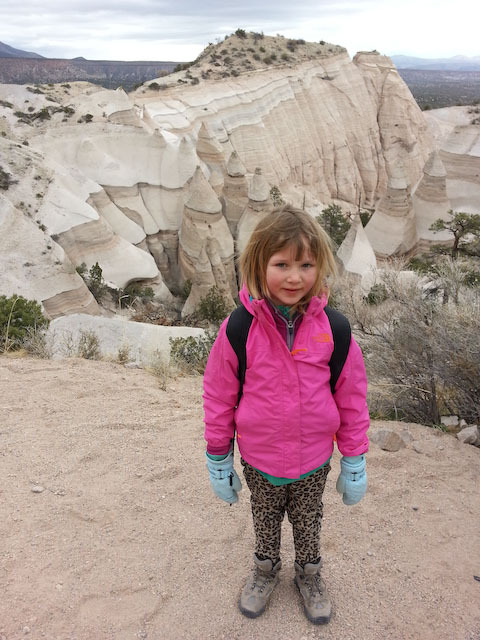 They found a small cave where they imagined life during simpler times and all loved hiking through the slot canyon to the top of the mesa to spectacular views. We started and finished our day by writing in our nature journals and drawing a map of our journey. It was a wonderful day, a great way to reinforce our learning about the geology of New Mexico.